Tired of solid colored scrubs? Ready to add a pop of style and a lot of personality to your shift? Zoe + Chloe print scrub tops, warm-up jackets and scrub caps offer everything you’re looking for in a soft, durable 100% cotton fabric. These printed scrub tops for women have all the great features you love, like roomy front patch pockets, side slits for ease of movement and a choice between V-necks and mock wrap top styles to flatter your neckline and your figure. And, you’ll find a print for every occasion and fancy! What’s even better? Zoe + Chloe scrub tops are priced at only $14.98 each, the printed warm-up jackets are only $19.98 each and scrub caps start at $1 each! You’d be hard-pressed to beat those prices! Not only will you find mock wrap and V-neck styles with side slits for comfort and flexibility, this 100% cotton scrubs collection features a print for nearly any reason or need. You’ll find stunning geometric prints and floral fields to brighten any day, furry and fuzzy friends appropriate for vet clinics as well as pediatric and therapy settings, toothsome prints for dental offices and holiday specialty prints to bring cheer during festive times. Zoe + Chloe also offers several prints incorporating pink ribbons for breast cancer awareness to honor a loved one or show support in breast cancer centers. No matter what kind of print you’re looking for, you’re likely to find it in the Zoe + Chloe collection at WonderWink Scrub Shop. And, this collection comes in sizes XS-3XL, so you’ll always find the right fit, too! Here are just a few of the dreamy and fun prints you’ll find in the Zoe + Chloe collection! Let Your Dreams Take Flight with These Zoe + Chloe Butterfly Prints! In Flight Shades of denim and navy take this blue and white mock wrap to the next level. Flutter Print A white mock wrap with red poppies and pops of yellow, purple and red butterflies. Lucky in Love Red four-leaf clovers and white butterflies adorn this light blue V-neck. Fly Away Red and blue butterflies take flight against the black background on this mock-wrap top. Love and Hope Love, hope and pink ribbons abound amongst the butterflies on this black mock-wrap top. Butterfly Bliss in Black and Navy Pink and blue butterflies flutter around flowers on this beauty. Country Quaint Yellow, white and red flowers dance across this royal blue V-neck top. Daisy Daze Smiling and sunglasses-wearing daisies brighten this pale blue V-neck top. Wings of Love Pink dragonflies, butterflies, hearts and flowers will make your mood soar on this V-neck top. Hawaiian Dream Surf on waves of tropical fun with this fun mock-wrap top with white flowers. My Garden This lavender V-neck top features big, bold delicate flowers to calm and inspire. Fido Navy Blue Print Top The red, white and blue dogs on this V-neck will surely find their bones! Bear Hugs Pandas, polar and brown bears, oh my! This V-neck has them all! Kissing Fish You won’t have to fish for color or compliments with this V-neck scrub top! Crabby Pants No more crabby patients with this scrub top! Turtle Power Lime, blue and green turtles come out to play on this white V-neck top. Owl Be Lovin’ These Owl Prints by Zoe + Chloe! Hoot’Nanny Even teachers will love the whimsical owls on this black V-neck scrub top. Owl Right Polka dots, hearts and flowers add to the fun of the bright owls on this navy V-neck. Forrest Friends These owls are in various states of sleeping, waking and wide-eyed whimsy on this V-neck scrub top. Whoot Toot Royal Blue You can toot your own horn with the wide-eyed owls on this blue scrub top. Holidays at the Hospital are Brighter in Zoe + Chloe Print Scrub Tops! Holly Jolly Green Print with snowflakes and reindeer for holiday cheer! Fair Isle Print in red with snowmen and hearts with a sweater knit look. 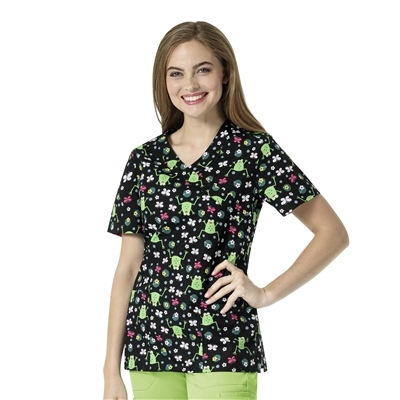 Turkey Day Take it up a notch with this gobbling good fun scrub top! Happy Halloween Bats, ghosts, spider webs and jack-o-lanterns spruce up this festive scrub top! Irish Luck Green, white and pink clovers wish you luck on this mock-wrap scrub top. As if it wasn’t enough that Zoe + Chloe scrub tops coordinate perfectly with WonderWink scrub pants, this collection also includes matching scrub caps and warm-up jackets! The scrub caps feature a terry cloth sweat band, covered elastic band and back tie closure to keep the sweat away and keep the cap securely in place. They are available in a one-size-fits-all option for all patterns. Zoe + Chloe warm up jackets feature snap-front closures, rib knit cuffs, side slits and two roomy patch pockets to keep all of your gadgets handy. Jackets are available in sizes XS-3XL just like the scrub tops. Check out a few of the fun patterns you’ll find in this collection. To expand your scrub wear wardrobe even faster, don’t forget to check out the WonderWink Rewards Program to earn points on every purchase you make. And, check out all of the other comfortable, colorful and durable collections at WonderWink Scrub Shop.